The boys like a nice pasta dish at weekends and I like them because they are really nice and quick to put together generally. This one has a bit more substance to it than their usual tuna or vegetable but I didn't want to be standing about on a hot day making a 'proper' bolognese sauce. The bolognese sauce for this was made overnight and so all I had to do for lunch was cook up the pasta and prep it for cooking. Of course, you could use the bolognese sauce alone with spaghetti too. 1. 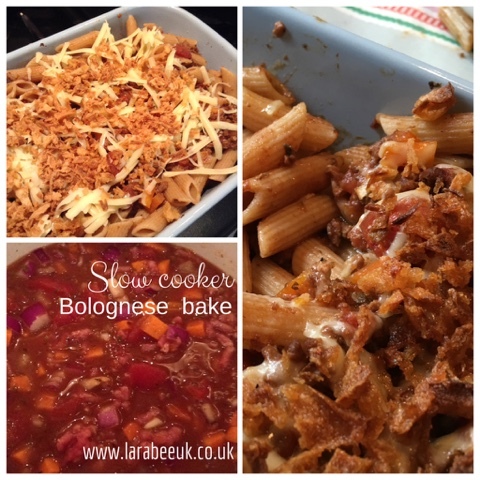 Throw all bolognese ingredients in the slow cooker, fill the tomato tin full of water and add that too. Cook for 7-10 hours on high, until thoroughly reduced. 2. 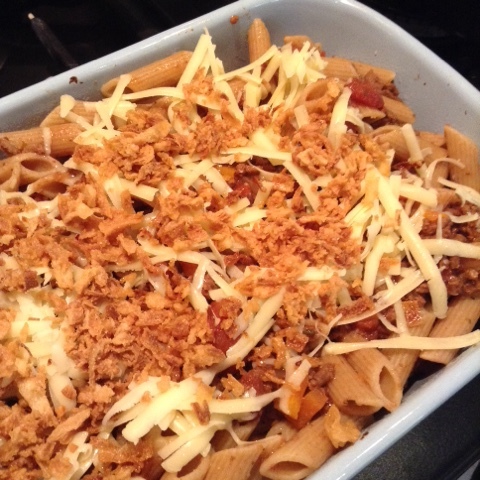 When you're ready to prepare, cook the pasta according to the instructions, drain and mix into the bolognese sauce, place in a 1 1/2 litre oven proof dish and top with grated cheese and onion flakes. I'm not ginving you the exact measurements for these as I find that cheese in particular is a personal preference, on a lot of recipes I've followed, sometimes I have to add more cheese and sometimes considerably less depending on the strength you use. 3. Bake on 180oC for 25 minutes, until heated through, the cheese is melted and the onions crispy. Serve immediately with salad. 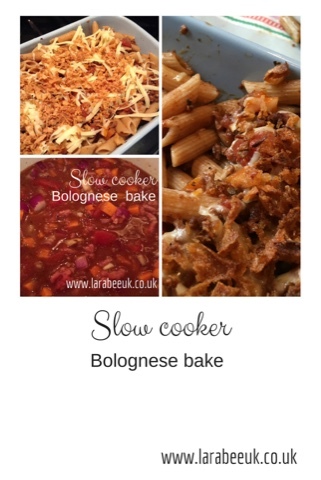 I hope you enjoyed this simple family recipe, you can see all our family friendly meals here.